They are undoubtedly some of the most successful games ever. A huge number of people is manically playing them. They come in all themes, for all ages, and are here to stay. So what do you think about RPGs? Do they deserve the attention they get? Why? Are RPGs the kigs of games or are there other, better alternatives? I actually enjoy RPG's, mostly Dongeon and Dragon, which is a really great game. But for video games... I don't like RPG's. I played pokemon (It's one...?) because it's a great game. Still play Firered and Mystery Dongeon. But... Real life RPG's are better in my opinion. I like a good deal of RPGs, although RPG can be pretty darn general and refer to pretty much any game. But for that exact reason they deserve that amount of attention. There's an RPG for absolutely everyone. So, yes, RPGs are the best, simply because they encompass almost every game ever. You can roleplay as Mario, Link, Red, Pac-Man, a CoD person, anyone or anything, really. Edoc, CoD is not classified as an RPG. My definition is much broader than anyone else's, from my experience. In my mind in any game that you're playing as someone or something that isn't you, you're roleplaying as them. Well, that's definitely a broad definition. However, playing as a character doesn't mean it's a roleplay. You need to have a character who somehow evolves and becomes better. For example, almost any Pokemon game can be classified as an RPG, but the one that fits best in the category is Mystery Dungeon, while Colosseum and XD are not really RPGs. Same with CoD. Playing a soldier isn't enough to be considered roleplaying (I think). I, for one, enjoy them. Pokemon introduced me to them, with a simple and addictive premise that had me hooked. Now, I've expanded into the more complex ones like Xenoblade and Fire Emblem. For me, and RPG has to me truly unique in one or more aspects to hook me. Cookie-cutter RPGs are god-awful to me. I really love the out-there ones: Swordcraft Story, Riviera: The Promised Land, Yggdra: We Never Fight Alone, Persona 4, Monster Hunter, Tales of... Yeah. They have awesome music, tooz. I think they deserve the attention, though I guess they are harder to sell nowadays. Average n00b young gamer: RPGs? These are lies! Give me CoD, where the RPGs are actual RPGs! See, I think they deserve more attention. Granted, they have been watered down recently due to corporatization in the gaming industry, with Activision making mostly shooter games, and EA continuing MoH and NFS, plus their sporting games, but RPGs are actually games. Don't believe me? Watch. This. RPGs include elements of the player's intelligence to see how well they do. Logic, memory, and the likes exist in them. Now, most games are like "Oh, here's the controller! You press this to do awesome things, like shoot, this to crouch, this to reload, etc." RPGs don't jump down the throats of the gamers. I've never been pissed off at playing, or while playing, an RPG. Why? Because you actually have to rely on your skills, not just go f****ng apes*** every time you die. First time I played Black Ops, I died on 25ish seperate occasions. On MW1, 20. While playing MW2, I died about 45 times. I actually ragequitted twice. Albeit not my fault, since MW2's campaign can go die in a fire in the corner where nobody cares. On FF1, I've only died three times. On FF2, I have yet to die. Note: It's the original FF2, not the one that the world outside of Japan calls FF2. I've been playing Fire Emblem: Awakening, and it is boss. You should all try it if you have a 3DS. If you're new to the series, playing on Casual mode will disable the fabled permadeath feature. In the past they weren't as much in the spot light, but I feel those were the better games as well. Engaging plots and character developments were key because you didn't have some fancy system that could recreate a flea farting on the bottom of the ocean during the middle of a Black Sabbath concert. Developers had to put more effort into plot. I'll take a classic RPG any day, I like to get sucked into a great story that plays out for weeks of gaming, not just 3 hours on Friday night. They still make some decent RPGs, but it seems like everyone now days wants to tack that title onto any game just to try and draw a broader audience out, which is fair enough, but just cause you gain exp points doesn't make it an RPG. You can call it nostaglia goggles if you want, but I still haven't found an RPG made in the last few years that has held my attention as well as FF7, Mario RPG: Legend of the 7 Stars, and Pokemon Red. SNES and PS1 was still the best in my opinion for RPGs, not to say there aren't good ones now though. Dark Cloud 1&2 are amazing, along with Rogue Galaxy, Skies of Arcadia was great, and many more. Just seems like the real gems lately are very few and far between. But then again, everyone is going to like something different. I love Quest 64 and Magi Nation, lot of people would disagree or haven't even heard of those games. Also D&D, Whitewolf, Pathfinder, and GURPS are tons of fun too. Always enjoyable to make your own story up as you go, that's the pinnacle of the term RPG to me. I'm confused. Do you mean that RPGs are more popular today than they were back then? Because, imo, they aren't. I think the term RPG is more popular now, but RPGs themselves were more popular back in the 90s. It seems like Quantity over Quality right now. Where do you think the future of RPGs lies? 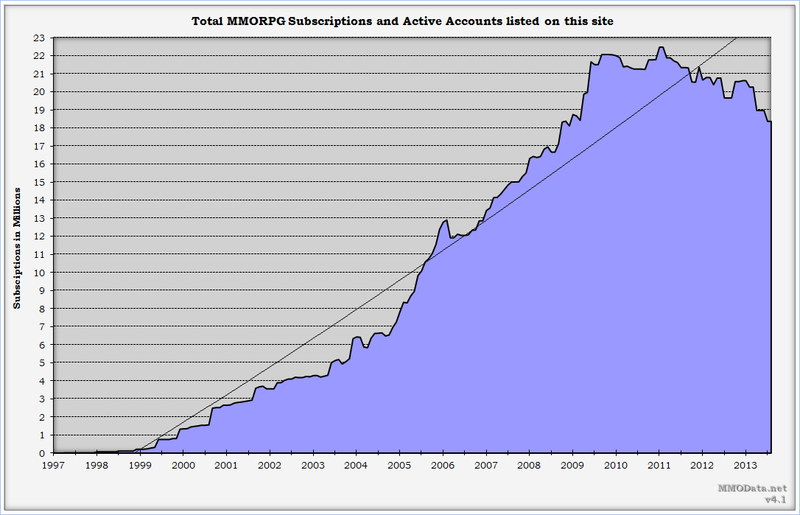 MMOs are getting more popular (and that chart doesn't even include games on the F2P business model which is being picked up by more and more companies), and even a lot of non-MMOs have plenty of social features they didn't have back in the day (even if it's simply something like a leaderboard). As the world in general becomes more interconnected, of course our games do as well. Do you think our traditional style of single-player RPG we know and love may die? On a related note, I finally got around to playing through The Last Story, and I was impressed. IMO, it's a very fun JRPG with polished gameplay mechanics, a compelling cast of characters, and superb music. I highly reccomend it for all people with Wiis and all people who like RPG games. My one complaint is that it's too easy, but for those of you who havn't played many RPGs before it should be perfect. Final Fantasy X - this is my favorite game! I think the main reason I liked it was because of the Sphere Grid. As I've discovered with many games, I'm more interested in developing characters than battling and I loved the freedom that came with the Sphere Grid. The story was fairly decent, at least enough to keep me going until I finished. I also prefer basic turn-based battle systems like FFX. I could go into a rant about what makes and RPG, but I'll avoid that discussion. xD I'm a huge fan of D&D and that kind of game, as well, but I never have anyone to play with anymore. ._. This game is so awesome! I'd love it if more games stepped way out of the box like this one did. The battle system did get boring pretty fast, and the other gameplay presents nothing new, but the whole concept around the game redeems it as not "just another RPG." I remember I always thought the way Polka says "yoshi!" after battles was so cute too.